Está abierto el periodo de registro para asistir a la 14a Conferencia Internacional de Docomomo, a realizarse en Lisboa, Portugal, entre el 6 y el 9 de septiembre de 2016. Información extra se puede descargar aquí. docomomo International invites researchers and practitioners involved in the process of preservation, conservation, renovation or transformation of buildings, sites and neighbourhoods of the Modern Movement, to investigate on the theme: Adaptive Re-use, The Modern Movement Towards the Future (read more on About). 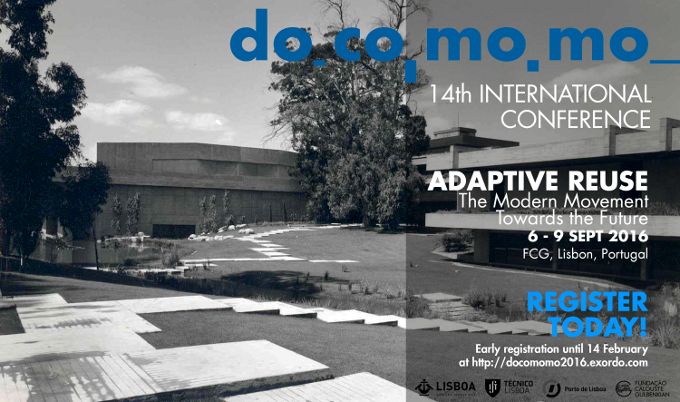 docomomo International is now accepting abstracts for the 14th International docomomo Conference that will take place in Calouste Gulbenkian Foundation, Lisbon, Portugal, September 6–9, 2016. Please submit abstracts no later than October 18, 2015 (12 pm GMT), for one of the 29 thematic sessions listed below (download it here). Sessions will consist of four papers, followed by 20 minutes for discussion. Each paper should be in English and take no more than 20 minutes to present. Conference papers will be published in the conference Proceedings.